Be available to work at least one home team bout. Attend an orientation session online or in person prior to bout day. Free admission to each BAD home team bout the season you are a BAD Hand. Priority shift scheduling. BAD Hands get first choice of which bout shift. Invitation to the end of season wrap party. Event Setup – Help setup on game day and stick around to watch the action! Track Maintenance – Want the best view of the track? Track Maintenance gets to be up close to the action, maintaining the track in between plays and at halftime. Box Office – Calling all social butterflies! Be the first face our fans see when they walk into our venue. Greet them at the door, take their tickets, and make sure they know the best places to be to see all the action on the track! BAD Merch & Raffle – This year, we’re expanding our volunteer army to some of our most saturated areas. If you love people and selling roller derby swag, these roles are perfect for you! Floater (put me anywhere!) – You’re a chameleon and can do anything, anywhere. Event Teardown – What goes up must come down. Help us clean up after the game, and head to the afterparty to celebrate our hard work right afterward! I can’t commit to the whole year. Can I still volunteer? Yes! We’d still love your help at whatever bouts you can commit to. Just select your preferred dates on the form linked above. If I select a shift during the game, do I have to work the whole time? 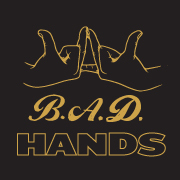 Our goal is to get enough BAD Hands staffed so everyone only has to work half the game. Help us do so by asking your friends, family, and your friends’ families to volunteer right along with you!